Your Home Can’t be Left Without Working Drain Lines. What is jetting? Do you need it? Drain stoppages are all too common for some homes, but it doesn’t have to be that way. Frequent stoppages are often a sign that there is an underlying problem with your drain and sewer lines. 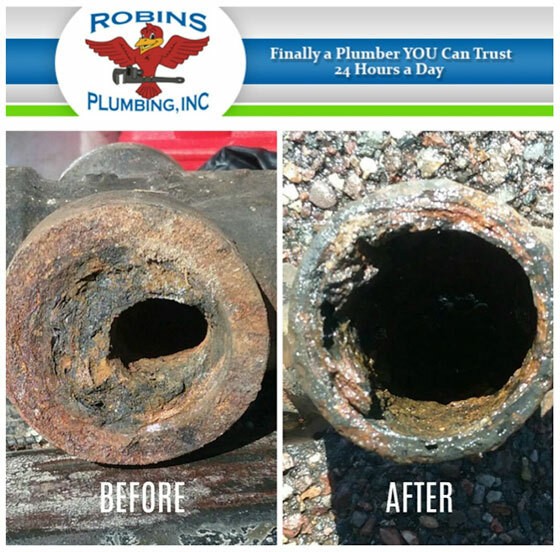 Sometimes that problem is simply buildup of grease, sludge and debris on the walls of your pipe making for a sticky surface as well as decreased diameter for materials to pass through. Grease and sludge can build up on the insides of your plumbing similarly to build up inside your arteries, and effects the health of your sewer system. A cable alone cannot clear grease and sludge off of the walls of your sewer and drain lines. That is where jetting comes in. Jetting your sewer and drain lines is similar to pressure washing, high pressured water with specific pressure and nozzles washes the grease and sludge build up off of the walls of your drain and sewer lines improving the condition of your sewer line and eliminating stoppages caused by grease and sludge build up. If you’re experiencing stoppages more than once every two years it is likely that your plumbing could use a health checkup and cleaning. We can run a sewer camera down your line to inspect the quality of your plumbing and advise if a jetting service is the answer to your chronic stoppages. As part of our jetting service we also run the sewer camera inspection after the jetting has been performed to ensure that your line is clean and without any other problems.